The Epson Home Cinema 4010 is the latest in Epson's line of 4K-compliant projectors that rely on pixel-shifting technology with native 1080p LCD imagers to deliver "4K Enhanced" resolution. Over time, Epson has progressively closed any visible gap between its pixel-shifted 1080p and other manufacturer's 4K-resolution projectors, and the 4010 is significant in its introduction of 4K PRO-UHD, a group of advancements that includes a new algorithm said to deliver on-screen results that equal or even exceed projectors rated at 4K (some of which also rely on pixel-shifting). We can't argue with this claim, as the resolution and detail observed from the 4010, aided by its 15-element glass lens, is tremendously sharp and dimensional, and suffers no observable smearing or other artifacts to call attention to the pixel-shifting or suggest the projector isn't full 4K. 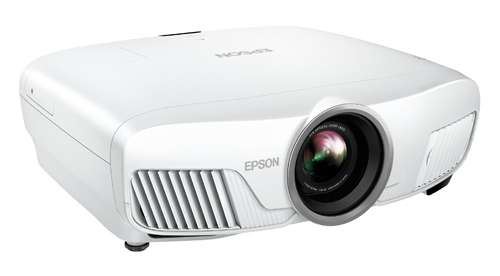 The 4010 offers some key improvements from its predecessor, the Epson Home Cinema 4000. It is rated at 2,400 lumens for both white and color brightness versus the 4000's 2,200 lumens. The 4010's dynamic contrast has also been bumped to 200,000:1 vs. the 4000's rated 140,000:1—still well short of the claim of 1,000,000:1 in the Epson Home Cinema 5040UB step-up model, but enough for a noticeable improvement in black level and shadow detail with dark content. Beyond this, Epson says it has worked on its tone-mapping algorithm for improved rendering of HDR content (with processing for up to 10-bit color depth). Other key benefits from the 4000 are carried over, including the aforementioned lens, a dynamic iris to boost contrast and deepen blacks on dark scenes, support for 1080p 3D Blu-rays; a Digital Cinema mode that delivers 100% of the expanded DCI-P3 color space; a 2.1x zoom with motorized focus, zoom, and lens shift; and up to 10 lens memory positions. Furthermore, the Home Cinema 4010's $1,999 list price comes in $200 less than the original introductory price on the HC4000, and its $1,799 street price (as of late October 2018) brings the 4010 closer to less-featured, full-4K budget projectors using the latest DLP imaging chips. This gives buyers a more clearly defined choice between full-4K resolution and a 1080p pixel-shifter offering more traditional premium features not often found under $1800, including robust build quality on a heavier and more substantial chassis than its competitors; a high-quality, wide-zoom, motorized lens with lens memory; and a dynamic iris. Readers should note that the Epson Pro Cinema 4050, introduced just prior to the 4010, is the same projector housed in a black case instead of white, packaged for the commercial integrator market with a mount, extra lamp, and more generous warranty. All findings in this review apply equally to that model. Up to 10 saved lens memory positions for Constant Height Image (CIH) installations on a CinemaScope 2.4:1 screen without need for an anamorphic lens. No support for 4K/60 Hz HDR. HDMI version 1.4 ports with 10.2 Gbps bandwidth (one with 4K-compliant HDCP 2.2 copyright management) limit the projector's playback to a maximum of 4K/24 Hz signals with 10-bit, 4:2:2 color processing for HDR, or 4K/60 Hz with up to 12-bit, 4:4:4 color processing for SDR. Measured input lag of 28.4 ms may be inadequate for some gamers. Frame Interpolation motion enhancement only available for 1080p/24 signals. Can you comment on 4k Sharpness/Black level of this vs. ViewSonic 727 and Optoma UHD 60? Sorry, neither is on hand to directly compare it to and I've not seen either in my studio to have any memory of these. I do have a sample of the Optoma UHD51A on its way to me, which uses the same .47 inch DLP as the UHD60, so I may get some idea from that regarding the sharpness. But I have to say that this Epson leaves little or nothing to be desired in terms of image clarity. Feed it good hi-res content, and it rewards you. The UHD60 uses the 0.66" DLP chipset not the .47 inch. Yup, I do stand corrected. I checked it quickly before I posted and misread our review. That difference in the chip could potentially affect contrast as well as possibly detail, so not a perfect comparison by any means. Is this projector good for 160" screen in fully light controlled room for movie watching? The brightness in Cinema and Digital Cinema mode seem to be very low. If Natural Mode is used for movie watching, Do you still get same colors as Cinema mode because i don't think the color filter works in Natural mode. It's only for Cinema and Digital Cinema. Suraj, the filter for DCI-P3 wide gamut color that's desirable for UHD content is only active in the Digital Cinema mode. You can get some additional brightness from the default by turning lamp power to High, though the number I measured was with the lamp already maxed out. The Natural mode or Bright Cinema mode, which also have well tuned color,are noticeably brighter. Still, our projection calculator estimates that at most, using the brightest Dynamic setting, a 160-inch screen will see no more than about 25 foot-Lamberts if you can mount the projector at around 16 feet throw distance, and perhaps as little as 22 ft-L if you can keep it inside of 25 feet. So it'll be somewhat less for the next brightest mode, Natural. There was a time when 20 ft-L on a projection screen would seem like a lot of fire power and it's probably fine for SDR today, but some people today target higher output for peak white on HDR viewing. Keep in mind that screen material can affect the end result; a material with some ambient light rejecting qualities can help overcome the big screen or a long throw distance. Thank you for this review. I really appreciate your efforts to get us this information. Looking forward to your comparison to the 5040, and your insight on whether that model will be updated in the near future. Honestly seems like the only flaw here is the HDMI input. Are there any third party converters that could solve that, i.e. allow HDR at 60hz? Burt, the primary compromises here are the lack of 4K/60Hz HDR capability and, more critically, the ultimately very good but still limited contrast compared with more expensive projectors like the 5040UB. The 4010 is quite good for the price in this regard, but it's still a budget projector and Epson saves its best Ultra Black (UB) technology for the step-up models. You can absolutely see it in a side by side comparison -- the 4010 never gets down to that deep inky black you get with some higher end projectors. Still, it's very good at extracting shadow detail out of mixed scenes, and its limitations really become most obvious on very dark scenes. The comparison review should be out by end of this week..
As for an update to the 5040...I have no direct info, but I think we can surmise that Epson will take the improvements they've made in the 4010 and apply them to a successor to the 5040. I'm sure we'll get some news on that going forward. Regarding a black box to allow this unit to play 4K/60 HDR, there should be no issue playing any 4K/60 HDR content; the projector would I assume ignore the HDR flag and play it as SDR. But in any event there would be no way to get it to process and display that signal as 60 Hz HDR regardless of any device that preceded it. It is possible, perhaps, to convert 60 Hz HDR to 24 Hz HDR either in the projector or by the source or a video processor in between, which I gather would retain the HDR information and simply play the program back at the slower frame rate. I didn't have a 60 Hz HDR source on hand to test this, but will query with Epson about what happens when the projector encounters a 4K/60 HDR signal. Check out HD Fury linker. Gamers are using this to convert 4k/60/HDR signals by dropping color depth. In a videogame, this is usually a non issue. It can also take 60hz signals and convert to 24. What screen recommendation would you make with this projector if used in a blacked out dedicated theater room? Would a gray screen be preferable over white in order to help contrast? I don't think a gray screen would be called for here in a dark room with controlled light. I got fantastic results with my Stewart matte white Studiotek 1.3, even with 3D, up to a 100-inch image. Gray screens have their place for punching up blacks in certain types of less-than-ideal conditions, but they also mess with the picture in other ways. Thanks for such a detailed review. It has made my mind up and when it is released down under, I'll be in the queue. Thanks so much for posting a thorough review. I'm wondering whether the projector's video processing handles HD cable/satellite sources well. Any help would be great. I watched a lot of cable TV on it and the 1080i/60 signals coming off my settop box looked great most of the time on HD movies. News had a bit of the digital noise and artifacts, and 720p content coming off Fox and ESPN suffered the usual modest sacrifice of overall clarity that comes with that (whether I let the cable box do the scaling or the projector). One thing I mentioned in the review is that you can't use Frame Interpolation to improve motion resolution on sports or other programs unless your set-top box has an option for outputting 1080p/24 resolution. Even 1080p/60 won't work. My basic Samsung cable box tops out at 1080i/60. Thank you for the comprehensive review Rob! I am wondering when Epson will release the update to the 5040 and how it will compare... hopefully the glass lens will transfer over. Steve, they haven't said when we might see that update, but I know their US team was in Japan last week for product planning and I'd have to believe that was among the subjects. I do know they carried over the 4010's lens from last year's 4000; they basically said it was already outstanding and no reason to mess with it. It's not clear to me if the existing 5040 has the same lens (as has been reported) or something better. Great review! I made some adjustments based off of your review. Icing on an already excellent cake! In regards to input lag, like brightness and uniformity, it needs context. As a movie buff but also an avid gamer (consoles & PC) this was a critical metric for me. Sourcing from multiple sites, the fastest 4k large format TVs in 2017/2018 reviewed as excellent for gaming range from 12ms - 32ms. In 2016 it was 19ms - 35ms. 5 years ago anything below 40 was considered great and 70 was acceptable! While the HC4010 is towards the lower end of what's considered great for 2018 it's still considered great! As far as pro gamers go: Games are locked @ 60 or 30 for competition. With pro gaming montiors or the fastest large 4k TVs, you're 1 frame slower at 60 and its a wash @ 30. Imperceptible for most. If youre competing you're not using a projector anyways. Some much needed perspective here. I'm not a gamer so really didn't have that context, but I will going forward. I had assumed because we see projectors considered ideal for gaming get down as low as 16 ms that 28 ms represented a more serious issue. Thank you, Manfred. It's interesting that while the overall lumens are higher in the 4010 over the older 4000, the brightness uniformity is better on the 4000 model (per the results you posted for the 4000 model) - "The HC 4000 registers 87% uniformity with the lens at wide angle and 85% at telephoto." Is that typical of raising the lumen output, which would result in worse brightness uniformity? David, I'm not sure if light output correlates in any way to uniformity, but I'm inclined to think the differences here are related to sample-to-sample variation (it is the same lens on both models) or maybe even to some minor differences in how the tests were executed or instruments used since different reviewers were involved. But the key here is that this is an extremely good lens and there's no visible effect. I refer you and other readers to David Stone's excellent recent article, "Brightness Uniformity: What It Means...and What It Doesn't." Looks like DCI-P3 color filter is only available on Digital Cinema mode, but the lumen output is too low for my environment. Which mode would otherwise give the most color-accurate picture for UHD content between Bright Cinema, Cinema and Natural? Not sure exactly what the difference is between those modes in this context. Thanks for the thorough review! Daniel, Natural would be my first choice to try if Digital Cinema doesn't produce enough light for you. The whites are a perfect D65 neutral-gray out of the box and it's a good, punchy picture. If that doesn't work out to your preference, Bright Cinema will deliver about the same light output with slightly warmer (subtly redder) whites. Mike, I can't give you a hard answer on this. Contributing editor M. David Stone did the 5040UB review, which showed significantly higher output than rated 2,500 lumen specs, while I measured with my own meter in my own space marginally higher than rated 2400 lumen spec for the 4010. The measurements are conducted to ANSI Lumen standards, which measure the light coming off the lens and take into account any variation in image size. You might check other reviews of the 5040 to see if you can find any other independent light measurements and how they match up to ours. Ditto for the 4010 as more reviews appear. Thanks for an excellent review Rob. I have a lot of standard definition DVDs. How did the Epson perform when upscaling standard definition -- any obvious artifacts? Adrian, the projector itself didn't do the greatest job scaling up from native 480i. I looked at a couple of DVDs, Dreamgirls and Ray (bit of a theme there). Not a lot of artifacts, but very soft. You'll want to let your source do the scaling if it's got a good processor in it, or perhaps a well-equipped A/V receiver in between the source and projector. Letting my Oppo BDP-103 Blu-ray player scale to 1080p/60 and then letting the projector take it from there made things much more watchable. But at the end of the day, it's still standard def DVD blown up on a big screen -- can't expect miracles. Is there a night and day difference between the 4000 vs 4010 in overall picture quality? Also is it sharper than the 4000? - A bit of extra brightness (2400 lumen max rating vs 2200 lumen in the 4000), which will be beneficial if you do any viewing in ambient light. - Slightly higher rated contrast, 200,000:1 dynamic vs 160,000:1 in the 4000. Not a huge difference and probably hard to see even in perfect conditions, but maybe visible to some degree in a side-by-side in dark room viewing with the right settings and content. - Any benefit in detail from the updated pixel-shifting in the 4010 is marginal at best, but it's possible there might be some observable benefit. At least one user on AVS Forum who saw both projectors in his space reported a slight improvement in clarity. But both projectors use the same high quality lens (16 elements total with 15 glass elements)used in the step up 5040UB. - Epson has made some modest modifications to their HDR tone-mapping scheme, supposedly to preserve a bit more detail in bright highlights, but these wouldn't be terribly discernible. Hello, greetings from Poland! Great review. Can't wait for the "battle" 4010 vs 5040! Is the 5040 still a better choice than 4010? Contrast, black levels, sharpness, color reproduction and HDR? Maybe some of this is better on the 4010? The significantly better contrast in the 5040 (or the 5040 successor that is to be announced shortly) makes it by far the best choice for dark-room theater viewing. The updates to Epson's pixel-shifting and HDR processing in the 4010 provide modest benefits that are vastly outweighed by the significantly deeper blacks and better contrast on the 5040. If you plan to do your viewing with some ambient light, that difference may be lost and the less costly 4010 remains a good choice. >> "Regarding a black box to allow this unit to play 4K/60 HDR, there should be no issue playing any 4K/60 HDR content; the projector would I assume ignore the HDR flag and play it as SDR." I'm interested to know if folks have any issue streaming Netflix or Prime 4K content. Obie, one thing I can tell you is that when I played the only 4K/60 Hz HDR content I had access to, the UHD Blu-ray of Billy Lynn's Long Halftime Walk, the projector ended up playing it back as 4K/60 Hz SDR with 8-bit color processing and Rec709 color space. This was with Sony's UBP-X800 as the source, but I'm not sure it would be the same with every source. Keep in mind that the signal that your source ultimately sends to the display, whether a streamer or a disc player, is arrived at as the result of its polling of the display during the initial HDMI handshake. In essence, the source component sends a memo to the display and says, "what's the best you can accept in terms of resolution and frame rate and color depth?" and then adjusts its signal output to not exceed that irrespective of what your settings might be in the source setup menu. We can be sure that no source connected to the HC4010 will send 4K/60 HDR -- it's beyond the projector's capabilities. But it might be possible that another source might send 4K/60 SDR with 10-bit depth or could be set to default to 24 Hz with wider Rec2020 gamut. I've not had the opportunity to hook a 4K streaming device to this projector. Maybe other readers can discuss their experience with Netflix or Prime 4K streaming with the HC4000 or HC5040UB. These have the same HDMI bandwidth limitations as the HC4010. Almost pulled the trigger on buying the 4010 last week. The comment about the 4010 vs 5040 (or its successor) regarding its deeper blacks and better contrast: "makes it by far the best choice for dark-room theater viewing", made me glad I didn't. It was just the information I'd been waiting for prior to purchasing my next projector for a dedicated, light controlled theater room. I'm sure I speak for many when I thank you, Rob, for your insightful and timely responses to our questions! Glad to help, Steve. To offer some additional perspective, no one should come away thinking the 4010's contrast is seriously wanting in any way. It's quite good for its price, but when you start stepping up to higher price points in projectors, you're traditionally paying for better contrast/black level and often a better lens. These days, you can also pay more for a laser light engine that does not necessarily guarantee better contrast, or for the privilege of 4K playback. In this case, with two lamp-based, 4K compatible projectors, the big step up in price between the $1799 4010 and the currently $2500 5040 is a huge and beneficial jump in contrast/deep blacks. Bottom line: it always comes down to budget. I'm a fan of buying the best projector you can reasonably afford with the maximum discernible performance benefit, and know that you'll be amortizing out the extra cost over many enjoyable hours of viewing. If you can't bring yourself to buy the best because of budget restrictions, buy the best you can in your price range. This 4010 is among the best under $2000. Are you planning on doing a review on the Optoma UHL55? I am on the fence between this and it. Steve, no immediate plans to review the UHL55, but it's on our radar for a look at some point. One reason we haven't immediately jumped on it is that it is a specialty product that does not provide the form factor or features we normally associate with a high quality enthusiast projector. Rather, it is a compact model with a cube-like case that seems intended for temporary placement on a coffee table. It has a digital rather than high quality optical zoom; has auto focus and auto keystone correction, neither of which are particularly desirable unless you're looking for something that's easy to set up again and again; a recommended "ideal" image size of only 80 inches within its 30in to 200in range; and brightness output rated at just 1,500 lumens vs the 2,400 lumens you get with the HC4010. It carries a relatively high price of $1,599 list that I assume is driven in part by its solid state LED light source, but does not appear to be playing on the same field as the Epson. I'll be curious to review the UHL55 at some point in the context of its intended use case and audience, but Optoma's more traditional 4K models in the $1,500-$2,000 price range or this Epson would be a better choice for the serious enthusiast. I'm a bit confused. Can I game 4k at 60fps on this? Also, how does 5000 hours translate for actual years of use? I understand that could be a big range, but just trying to justify the cost of use of this over the Optoma UHD60. So can it output 1080p/60hz/HDR? or is it only SDR with 1080p/60hz? Wes, the HC4010's 10.2GB HDMI version 1.4 ports limit the projector to 4K HDR at a 24Hz frame rate. So you can do 4K/60 without HDR, or 4K/24 with HDR. As for how quickly you might use up those 5000 hours, you only have to estimate who many hours per week you might use the projector in an average week and do the math. It may be a very different number for a gamer who's on the projector every day for several hours than for a movie enthusiast who barely has time to watch two movies a week. Also, the lamp ages and loses brightness over that 5,000 hours and some people will look to replace it sooner to restore full performance. So there are multiple variables to look at. As for 1080p/SDR vs HDR--I'm not aware of any 1080p content encoded with HDR. As far as I know HDR is strictly a feature of UHD/4K content. Hi Rob, I'm a bit confused about the resolutions accepted on the 4010. Your specs page shows only - 720p, 1080i, 1080p/60, 2160p/60, 576i, 576p, 480p, 480i No 24 or 50Hz I was going to buy this projector but stopped when I checked your specs cause I want 24 and 50hz compatibility. Kevin, the user guide is correct. Our database is showing only the maximum frame rate for each signal resolution. You can move ahead confidently with your purchase. Apologies for the confusion. I have a 134 inch screen and sitting at 15 feet do you recommend epson 4010 or optoma uhd60 ? I suggest you read our comparison review of the 4010's predecessor, the HC 4000, and the UHD60. The 4000 is nearly identical in performance and all the other differentiating factors still apply with the 4010. How is it possible that the street price of the Epson 4010 jumps back up to $1,999. Over the last 2 days all the store that used to sell for $1,799 are now $1,999. Thomas, short answer is that Epson was running a time-limited promo that apparently expired. Manufacturers control the street pricing of their projectors with MAP, or minimum advertised price, agreements with their authorized resellers. Retailers cannot by law be told what to sell a projector for, but their failure to follow MAP policy set by the manufacturers can result in the loss of things like marketing promotional support or even their vendor agreement. If you do find it advertised cheaper and it's not widely seen at that price, you should take care that you're buying from a true authorized retailer or your warranty may be in jeopardy. Just installed the Epson 4010 as an upgrade in my dedicated home theater. All is well except when displaying the Pattern, I am unable to precisely control the image width. It is a little too wide and spills over on the 108" screen frame. Any attempt the correct this with the lens zoom instructions results in the desired width but decreases the height so it does not fill the screen vertically. Keystone adjustments do not help this situation. This is a fixed ceiling mount. Do you have any suggestions? Hey Rob, I am considering this vs 5040, but the power supply issues that has plagues Epson models 5040 and 4000 has made me wary of going with Epson. What is your opinion about power supply issues on Epson 4000/5040? Zug, I recently addressed this question with Epson, who acknowledged that they had identified the power supply issue with the 5040 and addressed it during the HC 5040 and HC 4000's production lifecyle for new projectors leaving the factory. They said that some earlier samples still in retail inventory might suffer this issue, but they have been aggressive in addressing the failures through their usual customer service channels. New models built on the same chassis, such as the HC 4010 and the upcoming replacement for the 5040, should not suffer from the same failures. John, assuming the projector's aspect ratio is set for 16:9 you should be able to get a more-or-less perfect match with a 16:9 screen. Situations where this isn't possible usually means the screen is not a perfect 16:9 or that the wall on which the screen is mounted is itself not straight and presenting a perfectly flat surface to the projector. If the projector is not facing perfectly forward and is spun a few degrees too far to the right or left, that can also have an affect and create keystone issues that may cause spillover on one side of the screen, but you'd see it as the top of the image being non-parallel with the screen edge and leaning one way or the other. Considering this projector but am concerned with the fact that it has NO audio output! I use headsets and a stand alone audio system which requires the traditional phono output. Is there a way around this that I'm not aware of? Ed, the workaround here is to tap your video source component (or components) for their alternate outputs. If your source(s) have an HDMI output, they will likely have a dedicated audio output that is either Toslink optical or analog stereo in either 3.5mm minijack or dual-RCA configuration. If the output is optical and you need analog, there are inexpensive converters available that will convert optical to analog stereo, though these put out line-level signals. Your standalone audio system is equipped to handle line-level signals, though you would require a headphone amplifier (with its own volume control) for your phones if you're not already tapping the headphones into your existing audio system. Just search Monoprice.com or Amazon.com to see options for optical-to-analog converters and inexpensive headphone amplifiers. Another option is to use an HDMI audio extractor, such as the one linked below. It'll take the HDMI signal from your source component, give you Toslink and analog audio outputs, and pass along the HDMI signal to the projector. Again, the audio outputs are line-level and will not directly drive your headphones to appropriate volume nor give you any volume control the way your existing projector remote does. If necessary, you could add a headphone amp just for when you're using the phones. I've never used this device and can't say if it might create any issues with lipsync, but it seems to be rated for full bandwidth 4K signals, so it should not degrade your audio signals. It's cheap enough to give it a try. Hi Rob! Thank you for your amazing reviews. I am currently in a great mental debate over the 4010 vs 5040. We currently have a Sony VPL HW30ES. Our theatre is light controlled, however does not have dark ceilings (just can't get the other half to agree). We want to ensure that the step from the Sony is solid. Would you suggest one over the other based on the unit we're coming from? Cheers! Hi Brent. Not sure if you saw our comparison review of these two models, but I've provided the link below. This should help you a great deal. I would say that either of these will be a solid step up from your current Sony. The HW30ES is a terrific projector, one that I actually had as my own reference for a number of years. But the two Epson models have much more brightness than the Sony's rated 1300 lumens, and better optics. Also keep in mind that there's an expectation that the 5040UB will be replaced at some point this year with an updated model. Love the review. I was an Epson 5030 customer and next upgrade wanted to go to the 5040 or the 4010 but Epson's reliability made me go to Sony. Two months out of the original warranty I paid $900 to fix the HDMI input port- a $5 part. Last month it failed again. Also, if you scan the forums (AVS) there is a known power supply issue with the Epsons that Epson knows about but will not fix- it will simply send you another projector and HOPE that it works. Some Epson customers have had FIVE projectors replaced by Epson. The second $5 part failure and the looming power supply failure swore me off of Epson, even thought I acknowledge they are king of the less expensive projectors. Too bad too, I wanted a 4K Epson but am superbly happy with my Sony HW45ES! "Epson has identified and addressed an issue in select projector models that may cause a small percentage of units to not power on. The issue has already been addressed in models shipping from Epson, but there is a possibility of a small fraction of units still in channel inventory that may be affected. Epson places the highest priority on product quality and customer satisfaction. For customers in need of a replacement unit, please contact Epson customer support at 1-800-788-0336. We will handle each occurrence on a case-by-case basis consistent with our warranty." I know that sounds like marketing-speak, but here's my own bottom line interpretation (no additional input or insight from Epson, just my speculation): they obviously became well aware of a widespread issue somewhere in the life of the product (whether caused by a a defective part shipment or an unforeseen design issue) and addressed it as quickly as I'm sure they could. These have proven extremely popular models for them, and I believe them when they say it's a small percentage overall that are affected, even though it may seem otherwise given the appropriately loud protests from vocal AVS members. Look at it from Epson's business perspective: they discover a problem, they realize it's not a 100% failure rate that would suggest it requires the massive loss associated with a full recall of the product, so they make the commitment that they'll fix it in future production from that point on (or the earliest they can make the required changes if re-engineering and QC testing is involved), and they make a concurrent commitment to stand behind customers whose products fail. If all Epson has to cover that failure is the ability to send another unit with the original design or parts that also may or may not fail, then that's what they're going to send and hope the second unit ends up working better for the customer. Keep in mind that this is pretty much a nightmare scenario for a manufacturer -- it's very costly financially to replace these units and it's costly to the brand image. If they could have fixed it sooner I'm guessing they would have. And I think everyone can be confident that, short of buying one of those leftover and lingering earlier 5040's hanging around in retail inventory, this won't be happening again with the new models built on essentially the same chassis. There would be no logical explanation for this issue carrying over into the 4010, or the upcoming replacement for the 5040. I can't speak to whether every single customer who suffered a failure was given the fair shake they deserved; a product that failed from this specific power supply issue six months or a year out of warranty should have rightfully been replaced for free in my view, and I haven't read all the posts to know if anyone was left badly out in the cold. But I gather the vast majority of people who experienced this failure were taken care of at least once if not repeatedly, and that Epson did the best they could with a difficult situation.